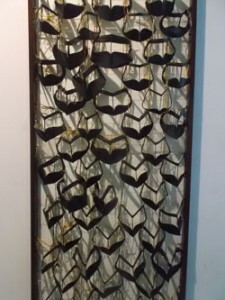 A recent visit to Dubai brought me to the UAE Women’s Museum. It’s located in Bait al Banat (‘Girls house’) in Deira, the older part of Dubai. I had been following them on Twitter for a while and it was on my list to visit. It’s an inspiring place to visit. Let me tell you why I think so. The museum was established by mrs Rafia Ghubash, an Emirati professor. Besides preserving the history of women in the UAE, she wants to break down stereotypes about women. The general vision here in the West tends to be that women in the Arab world are in a second rate position. I know better, and this museum visualises this. UAE Women as business people, professors, as artists and also in their contribution to society as mothers of the next generation: it all gets full coverage. 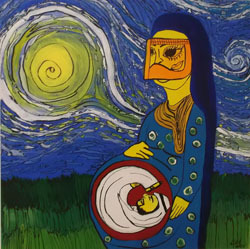 I learned more of the origins of the facial cover Niqab and enjoyed this piece of art. The upper floor is dedicated to poet Ousha Bint Khalifa and it’s truely a tribute. The poet is in her nineties and apparently not in good health. I hope she heard about this beautiful exhibition of her work. She must be so proud to be honoured this way. Some translations of her poems in English would have made this exhibition more accessible for non-Arab speakers. However, visually, it was a feast! The art gallery with works by emerging UAE female artists is my favorite area. For example, I loved the paintings by Khawla al Marri, including the one at the top of this post. It’s really a place I can recommend to visit, because it helps you develop a broader understanding of the UAE and the role women play in the fast developments. It’s a pleasure to have a female perspective in a region with a still dominantly male face. Website of the Women’s Museum. Follow the Women’s Museum on Twitter.